The search is still on. I have 2 out of 3-4 slots filled for this campaign. I'll be running it fully as a GM. It'll be done over OpenRPG. If you have access to Skype for voice chat, great. You don't need it however, it's just available to give out quick rules clarification to help speed up the game. I'm still looking for Player's. 1 more to start the game but 2 max. PDFs for the books can be found here. OpenRPG can be found here. I've put up another thread trying to see if this was even something anyone would be interested in but I'm looking to start a game (or if I get lucky enough become a player in someone else game). My time is EST and with work+wife+child, my time is limited to late evenings during the week (8-9 PM until about midnight-1 AM). I'd be capable of a single day during the week. I figured that putting this here would be better than penandpapergames.com considering the obvious: It's a PokéMon Campaign and this is a PokéMon forum. I'm looking for players of 3-4 people. I won't GM more than 4 people or less than 3. The actual game will take place on a program called OpenRPG under the DEV II server. I will have Skype open for players to have a place for OOC comments, questions and rules clarification. World details, Trainer details and starters/etc. details can be discussed elsewhere. For clarification, this is a table-top PokéMon RPG. It uses a D20 system of play. D&D, D20/D20Modern (and all other games using the D20 system) and Pathfinder are examples of a table-top RPG. Anyone interested in being players? Anyone interested in being a GM? Last edited by Kaori Sakura on Mon Apr 09, 2012 10:40 am, edited 2 times in total. I'm interested in being a GM, but I dont have a Skype. Is that a necessety? Skype in particular, no, I wouldn't say it's a necessity but any voice chat would do better than text to quickly solve rules clarifications or provide OOC while the actual text of the game is the in-character things. I just personally prefer to have as many things as possible to keep from slowing down the game itself. Ok well I dont have any video chat... Yet. Video chats isn't what I was referring to, but I've used it for D&D several times and it does make things go by a little quicker but voice chat does the exact same thing. Again, this isn't required for the game, it just saves time. Also: The character sheet in the back of the Player's Handbook hasn't been (as far as I know) converted into an editable PDF form yet, so I've gone and created my own. It's a 2010 excel document but plenty of things out there can convert it easily. If you don't have any programs out there that can convert it comfortably for you (best being excel 2003 or 2007), gmail can convert it perfectly (and sometimes even better than excel itself) into an online document that you open, edit and save. I'm a very lazy individual so the excel character sheet does a lot of the calculations for you, including stage increases and decreases. Ok. I'll look at the PDFs and such tomorrow, since I have a laundry list of things to do today. I've read the Player's Handbook and Game Master's Guide from cover to cover so I can answer any questions that you may have from either skimming or reading the books. I'd much rather be a Player than a GM (Have been GMing for 4+ years now) but if need be, I can GM if you or someone else doesn't feel up to it right away. Hopefully, though, we can find player's. With this rep, keep in mind that I haven't read the rulebook. YET. If I get a bit more interested, I most likely will. But before I do, first a few questions for clarification's sake. First, as to the "OpenRPG" program. I have not heard of this program before; is it relatively easy to download and get used to, or are there some tricks involved to it? I don't think I saw a link in this topic anywhere but I might have missed it. I am not sure when I'll be able to start devoting large amounts of time to this (small amounts should be possible), as I have an exam on my birthday (in less than 2 weeks, even) and will be leaving on vacation that weekend, so I have a fair amount of prep work to do there too. For the time being, I guess you could call me tentatively on board, but I want to see what else is necessary to be involved. Well, the fact that you’ve never played it before isn’t a bad thing, this is just a new, and hopefully recurring, experience. The majority of my Player’s had never done a table-top rpg before and are still playing to this day. As for OpenRPG, you’re right, I didn’t have a link for it so I edited the opening post to have it now. OpenRPG is the only free program I’ve ever found that allows for multiple people online to do table-top games. It allows for backgrounds to be drawn or uploaded into the program for everyone to see as well as miniatures. It also serves as a chat system which allows for the roleplay portion of the game to occur if the group decides to go with text instead of a verbal based system. The program also comes with a dice roller, which is needed for tabletop rpg’s. There’s no real trick to it, other than it being a free program and thus, can be a little glitch but it’s constantly updating so the problems are usually fixed by the time you use it again. Install it and don’t update it is all I can say since when you install it, it’ll automatically be updated to the latest release. As long as you have the PokeDex Book, you won’t need your handheld and the Player’s Handbook has a chapter that lists every attack available to all PokeMon. It’s organized by type and in alphabetical order. Although if you feel better having it on-hand, feel free to. I do need to stress that the power gaps between pokemon have been severely lessened, although the power gaps from regular pokemon to legendaries have increased significantly, thus making them what they really are. This is something I appreciate as it makes how you trained your pokemon the main factor in a battle rather than it being: I have a Dragonite, your Raichu is dinner! thing. To elaborate more on the table-top rpg differences from the rest of the handheld franchise: Your pokemon aren’t limited to 4 moves. They have access to all moves they’ve ever learned. To balance that out, certain moves have limited uses and other don’t. For example: Pikachu’s Thunder will be a one-time use until it rests at a PokeMon center. It’s Sucker Punch is a one-per-battle move and it’s thunderbolt is an every-other-turn move while thundershock can be used every single turn. The stronger it is, the less often you can use it but you never have to forget anything and you aren’t limited to a small number of moves. PokeMon stats don’t increases rapidly. Each level you get 1 stat point to place in any stat, this makes developing your pokemon important and you can’t re-do them if you screw them up. Just gotta breed or catch a new one and re-train it. Lastly, it’s realistic. And thus, both you and your PokeMon can die. That’s right, die. The world is based on habitat and diet. PokeMon that aren’t omnivores or carnivores more than likely won’t bother you unless you’re in their territory or threaten them or something they hold dear. The ones that are, however, may hunt you down, seeing you no more than easy food. Your trainer matters. Your trainer plays a key part in a Pokemon growth, abilities, moveset and how they fair. Their loyalty matters as well but if you aren’t a jerk, things should be fine. RPG is a Role Playing Game. In it, you control your character, he/she makes their choices and the world reacts accordingly. There’s no real major visual other than your imagination (although there are miniatures but it’ll be more closely related to the Gameboy rather than a 3rd generation console game). But, your imagination is the real thing working here. You say you do something. “I go to the PokeMon Center, etc.” and I, the GM, explains everything from that. I explain that you make your way from (wherever you were) to the PokeMon Center. Something may stop you, if something does, I’ll notify you with description. I’ll try to describe things in a manner that will help you visualize the situation without slowing down the game with flashy words and too much detail. However, let’s say you do make it to the PokeMon Center. I’ll state that you get there and then I’ll describe the interior and any key factors your character will pick up by just walking in. The way the place looks, who’s in it and stands out (those that don’t stand out you may not notice) and things of that nature. You do something by saying you do, but it’s best not to be mechanical about it and instead remain ‘in-character’. Do what your character does, behave as he or she would, etc. Sometimes you can’t help but be mechanical but doing it too often takes away the experience. Of the game itself, not your pokemon. Pretty much, you do: I react is how it works. I could go on and on about what an experience is like for a table-top game but to be honest, the best way is to just experience it for yourself. Create a character and try it out. Decide for yourself then if it’s something you’d want to devote time into and play on a regular basis. If you like it, it’ll open a large variety of doors for you. If not, you’ll be no worse off than you are now. At least you gave it a shot and now know it isn’t your thing. To answer your other question about control, it’s a yes and no deal. You will mainly control your Trainers and only your Trainers. The GM will control your PokeMon until combat starts, in which case the PokeMon is fully under your control, unless it’s loyalty is low and it hates you. Then it’ll behave like a traded PokeMon you don’t have a high enough badge for. Or if it hates you too much, it may flat-out try to escape from you or kill you. As far as time restraints go: Table-Top Gaming very rarely occurs at the drop of a hat. 95% of the time, the group comes to terms on a day of a week (or a month in some cases but it’s rare that it’s monthly) that everyone can be free for and then every week the group meets up and games for a few hours. The average time is roughly 3 hours. Some groups game shorter times and some game into the next day (I’m serious too). Hmm... I'll see if my friends laptop can download it. The chats fail right now, as theyre not loading on the computer. But, if it downloads perfectly, count me in! Chats fail to load? Do you mean messenger chat programs? That's awkward if they all fail. o.o Yahoo, Hotmail, Gmail, Pigdin (since pigdin can also establish facebook chat as well), etc.? That's awkward. Or do you mean the voice chat? If voice chat fails on your end you can at least still hear other people. If you're not GM, then I would say that it's not quite that bad. But if you are, well, there's always text still. Ahahaha, what a large post. And I did read it all! I'm actually rather familiar with RPGs and have played in a few text-based ones myself - I'm fairly good at it even though it isn't one of my favorite things to do. I also try to have a laugh or five while playing in it (and, if possible, I try to make the GM laugh too), so the concept of an RPG isn't totally new to me. I was just wondering how different tabletop RPGs would be from text-based ones...and by the looks of your description, not that much. That's fortunate; it means the learning curve won't be too large. Is there a standardized Pokedex and such for this RPG or do we just use the information already given to us in the video games? Either's fine by me. As for the level-up, why only 1 stat point total to place somewhere? It would probably make a bit more sense to have a gain in each stat proportional to the Pokemon's base stats, plus you get 1 more after that to place somewhere (similar to the M&L RPG series from SuperStar Saga and up, if you're familiar with their level-up system). I wouldn't advocate big numbers, but I don't think I'd advocate small ones either. Yeah, large post as I threw a lot of info at you spawned by your questions. I try to give you as much information as I can that can adequately answer your questions. Especially when it’s in a forum and you can always come back and re-read it later for clarification in case you missed something or misunderstood something. Ah, I was under the impression you had only experienced console RPG’s, not text based ones. No, it’s not that different from text based ones with the exception that you only have control of your own character. You and the rest of the party are in control of your Trainer only, given the exception of your PokéMon during combat, unless their loyalty is too low. Everything else in the world is controlled by the GM, but other than that, no, it’s not that much different so given your experience, a much lower learning curve. Yes, there’s a standard PokéDex. There are three books for download. The PokeDex (Bestiary),, The Player’s Handbook (What you’ll be looking at most of the time) and the Game Master’s Guide (something a player should never read. Ever.). The PokéDex and the Player’s Handbook have everything you need to play as a Player and explains everything you need to know, although some of the information is poorly placed. I’ve read them all cover to cover so I can answer any and all questions regarding the book. Except specific features. I didn’t bother to memorize things like that. I know how they function, how often you get them and how they work, but if you asked me what a Massage Therapist class features were, I’d just give you the page number to it and tell you to read it yourself. As for the 1 point per stat thing, this is a D20 system. Meaning the only dice you’re using are 4-sided, 6-sided, 8-sided, 10-ssided, 12-sided and 20-sided dice. The D100 dice are two 10-sided dice where one is designated as the 1’s and the other as the 10’s. The D100 is used only for capturing a PokéMon while the rest are used for attacks. The system itself is based around much lower numbers and the purpose of the stat-system, level-up system and the ratio was to lower the power gap between PokéMon, bringing an emphasis that trained ones are indeed stronger and that a Trainer is much more important. IV’s do not exist in this system but there are plenty of things in it that don’t exist in the games or anime. It’s well-thought out, I assure you and well-tested. Your stats ARE based on the base stats. While you only get 1 stat per level up, where you place that stat must follow the lowest to highest of your base stats, after your nature has been factored in. If your Speed is your highest stat and your HP is your lowest, then when you allocate your 1 point, your speed must always be the highest stat and your HP must always be the lowest stat. There are plenty of other ways to increase your stats, even permanently, but the system works very well. To simplify: The Player’s Handbook has all the PokéMon Moves in detail and the PokéDex has all information on the PokéMon themselves: From habitat, height, weight, level-up moves, tm moves, tutor and egg moves, diet and movement abilities. Detailed abilities, such as invisibility, burrow, sky, land, etc. is in the beginning of the PokéDex. Also: PokéMon aren’t limited to just 1 ability. They gain a second ability when they reach 25th level and gain access to their high ability at 40th level. You can hold off on your 2nd ability, however and just choose 2 high abilities at 40th level if you so wish and you can re-select your abilities when you evolve. When you start the game, you start off as a LV0 PokéMon Trainer. You don’t gain experience like your PokéMon do but instead just gain levels whenever you do something that forwards your worth as a Trainer. Gaining badges, catching or viewing a certain number of PokéMon with your PokéDex, earning Ribbons or Trophies, defeating the Elite 4 or Frontier Brain, etc. each gives you a level. When you gain a level, you gain 1 stat point to put to your stats as a Trainer and gain a feature. If you meet the prerequisites for a particular class, you can become that class. This includes, but aren’t limited to, Psychic, Breeder, Martial Artist, Researcher, etc. Each of these classes have advanced classes beyond them that you can get into as well when you level if you meet their prerequisites. 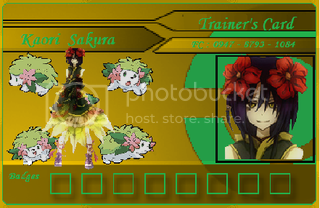 Some are: Move Tutor, Massage Therapist, Chaser, PokéBall Crafter, Weapon Master, Type Ace, etc. The level cap for a Trainer is 50 and the level cap for a PokéMon is 100. You can have a max of 3 classes as a Trainer until 25th level, where you may get 1 more class for a total of 4. Whoa! A lot of large posts that make my brain hurt! Anyways, when I said that the chats failed, I meant the PsyPoke chats. I've never attempted to chat using any of those, save the Facebook one. This looks like FUN. Yes please. Sorry for the lack of response. My weekends are quite chaotic. But, I'm glad the idea sounds fun to you. If you know anyone else who may be interested, whether it be irl or here or smogon, let them know. If there's 3-4 people here who are interested and can put aside 2-3 hours on the same weekday evening/night, I can be the GM. I already have a PokéMon world pre-set for a campaign, along with a list of starters although I'm a harsh GM. I can teach the game through the easiest means I know how: You say what you want to do and then I simply tell you how to do it. Overtime, you'll grasp the game on your own and it doesn't slow down gameplay, which is important to me personally as I don't have the most time to spare. However, I enjoy employing a real-time world. That means, the world doesn't revolve around the main characters. It's a living, breathing thing. When you visit a town, you get to interact with people and PokéMon, chat, trade, battle, etc. Things occur with or without your intervention. You may or may not hear about them and when you later return to town, things may or may not be different, depending on what happened while you were away. Does this means nothing the heroes do matter? Of course not. What you do greatly affects the world, but things won't sit still and just wait for you if you do nothing at all. But, why does that make me a harsh GM? It doesn't, but here's where it does. PokéMon replace things in the world called animals. Animals behave differently depending on specie but for the most part, their diet determines their hostility. Carnivores tend to be more aggressive and stay in groups. Anyone familiar with a Sabretooth Tiger? Anyone familiar with a Mammoth? Which one hunted which? That being said, while Humans are at the top of the food-chain due to our technology but that doesn't mean we can walk around in small numbers in the wild and think a pack of Houndour led by a Pack Leader Houndoom will just ignore us. If it thinks we're easy prey, it'll attack and for the most part, it will never be in our favour. Wild animals aren't the most intelligent on the planet but they know how to gauge predators and prey and don't put themselves willingly in situations that aren't best for them. PokéMon are superior to them in terms of intellect and power, which immediately makes it harder for Humans to travel around. If you remember the handheld games, early in just about each, every Professor screams at you that the world is dangerous and you need a PokéMon to protect you. That was a child's game in a child's world. This is far more realistic where the consequences are much heavier. That's why I'm a harsh GM and why I have the 3-4 player limit. My world still follows the traditional games, sort of. It still follows the various regions and Gyms, but it takes place years after the travels of Red (which considering the timeline of Gold and Silver or their remakes and he essentially looks just about the same, it'll be years after all the main characters travels). Thus, the Gym Leaders may or may not have changed (won't give away too much) and the wild encounters are essentially the same but the Global Trade Station does exist in each town and you can use it. Can you encounter PokéMon that's not native to a region? Yes. Will it happen often? No. But if you desire a certain PokéMon, that's what the Global Trade Station is for. Or you can go to that region. If this still sounds fun to you and to anyone else, I am available as a GM. I'm definitely being a GM, so you can sign me up. However, is it also possible to be a player? That's great. ^-^ You may want to start figuring out how things will pan out in your campaign. How rare certain PokéMon are, what plot you're going for, whether or not the party will have PokéDex's or if they'll just record things in a journal or other medium. How difficult your campaign will be, from wild encounters to Gym Battles and so on. How players will get money, what items are in your world and how different they are in price (the Player's Handbook lists PokéBalls as 200-300 ¥ and all other balls, except Great Balls, as 1000¥, which according to the games isn't the case). Plot can be facing off against a Team-whatever, Legendaries causing problems or something similar. Don't forget small-time quests, or side-quests. The combat example in the back of Player's Handbook hint at Bidoof and Bibarel creating a dam nearby a town which causes unexpected flooding that may lead into the terrain changing from forest/grassland to marsh, which would cause a large number of PokéMon to migrate elsewhere. Oh, and what PokéMon you'd allow as starters. I'm personally pretty open with starters. As, I'd allow a Dratini to be a starter but not a Larvitar. To me, it's the strength of the starter itself I look at, not the final evolution. Dratini isn't powerful and WILL give its Trainer a difficult time trying to grow because of that whereas a Larvitar won't. To me, it's up to the Trainer to decide on their starter. If someone wanted a Pidove for a starter then, they can have one. If they feel like they're a weaker Trainer compared to the rest of the party, where someone started with an Aron for example, I'm not going to really care much. I want you to have fun, yes, but I'm not going to bend over backwards to fix a very clear choice you made. If, for example, you realized a few levels or so later that you didn't like the nature you chose for your PokéMon, or maybe after experiencing the game, you realized that the stats you put your Pokémons points aren't as important to you and you'd like to change it, I'll let you. But if you suddenly realized that Pidove wasn't the best starter for you, I'm not going to let you change it. You'll just have to catch a new one or put it on the GTS in hopes for something else. About being a GM and a Player, yes, that's very possible however I very, very, very much recommend you don't do that. The only time I personally say it's a great thing to do is that the campaign is only between you and one other person. Reason being, it's difficult for you to play a Player Character AND all the Non-Player Characters without having a bit of meta-game knowledge. Your character may end up doing something they wouldn't have any knowledge of or spout information to the party that the party wouldn't have any knowledge about. What I recommend if you want to have a personal touch on would be to make your character the rival of the party. Give yourself more focus on the campaign, story and making things work for your Player's. If you involve yourself as a Player as well, you'll end up loading yourself with the task of aiding the party, leveling up your character and PokéMon, etc. which will inevitably slow down the game. Trust me, I've tried it before and that's exactly what happened. One on one campaigns, it's great and should be done. Two or more, I wouldn't recommend it at all. Cool. I'll try to finish the stuff listed in the op. As far as starters go, since we will need to have a pokemon protect us, no plants for me! BUT! Since I'm more mainstream, would, say, Emolga or Oshawott or Squirtle or Cyndaquil be accepted? Also, I have an RP in Ecruteak that is about fighting a certain team. Can I use that team? In case anyone viewing the thread thinks that this has been started and it's no longer going on, this is a reminder that it hasn't been started and that there's only two definite members taking the slots and two slots are still open. Well, if you're going heavy mainstream, whatever starters for the mainstream where the region is would do well, but the key to being a good GM would be not to limit your players' options. People are diverse and just like you don't like plants, I don't like fire. I prefer plants although I hate all original starters. If I were to be a player, I'd opt for an Oddish, Budew or Petilil as my starter. If those weren't available, I'd then lean to a Nidoran M/F. If you were to tell me I need to choose from the original starters I would honestly say no and I'll go out and fight PokéMon myself until I find something I want. If my character dies, that's fine because that's my character's decision to be picky about his PokéMon. The GM's Guide has a small list of PokéMon that would be fun to have as a starter and it hits a lot of ranges. From what I understand, they tend to keep it three stage PokéMon where the difference in power between the pre-evolution and final evolution aren't dramatic. If something doesn't evolve, or if it's base stats are too high, it generally doesn't make for a good starter but at the same time, you're the GM, you make the call. For example: Having a Tauros or Scyther as a starter isn't a good idea as they're very powerful. Having a Growlithe as a starter is even pushing it. See where I'm going here? As for the Team you have in a roleplay you have going on, sure, that Team would be fine. It's your story you're telling the players as they interact with your world and become a part of it. Sorry, my summer just got jam packed. I probably wont have enough time between keeping out of trouble, building Ninalldo, school, and other commitments, most to friends, and work. So I cant participate. Best of luck to you, though! The campaign's been going for a few weeks actually, and I'm not totally sure if we can get new peeps in at this point. (I mean, you could, but you'd probably be behind.) It's up to the GM, though.